Responsive, WordPress & jQuery driven website. Vacuum Engineering Services Ltd have over 20 years’ experience and knowledge in providing helium leak testing machines, on-site helium leak detection, training and expertise. 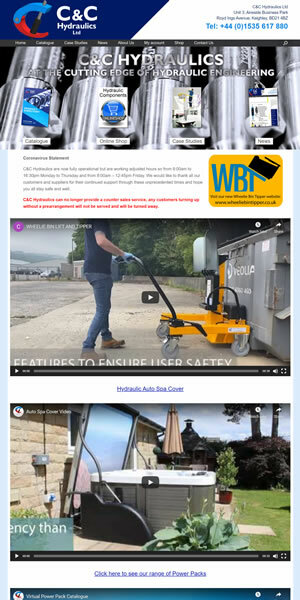 We have been managing Vacuum engineering’s web presence for over 10 years and have helped them to keep up with the latest trends and improvements in web design technologies. We did all of the branding for Heritage Saddlery, a company established for over 100 years! To bring them into the 21st century we have built their ecommerce site using Woocommerce & WordPress – a brilliant combination. C&C Hydraulics use their website primarily as a catalogue for their extensive range of hydraulic products. This saves time & money on their printed catalogue & ensures that their products are immediately available to a worldwide audience. One of the country’s premier dance studios, this is a busy site which prompts lots of enquiries & bookings. Bright & colourful, with extensive picture galleries the site has timetable & syllabus information and it drives huge amounts of business to the dance studio. Jackson’s Dairy are famous throughout the North West for the quality of their dairy produce, and we have made them a site to match their reputation. This WordPress site is widely used as a platform to contact the dairy, with enquiries ranging from “please cancel our milk on Tuesday” to “Can you supply milk, cheese, bread etc to our shop on a daily basis” and many more. UK based Sales Training company, DSTC rely largely on their website to drive business. Rija Media are responsible for all branding & maintenance of the website & we also design & manage their Email Marketing campaigns, with full reporting & lead generation.